Police communique warns of suicide bombers in KL and Sabah! IT WAS A POLICEMAN WHO SPREAD THE NEWS THAT SUICIDE BOMBERS WERE IN SABAH AND KUALA LUMPUR. KANGAR: Police have identified the policeman responsible for spreading a viral social media message about alleged suicide bombers planted by Abu Sayyaf in Sabah and Kuala Lumpur. Bukit Aman Internal Security and Public Order Department director Datuk Muhammad Fuad Abu Zarim said a thorough investigation was still ongoing and disciplinary action would be taken against the policeman who was currently stationed in Sabah. “I am going to Sabah by end of this month and I will personally meet the policemen who had spread the message which went viral on social media. “We will investigate the matter thoroughly and disciplinary action will be taken against him,” he said during a press conference at Mess Pegawai Kanan PDRM here today. It was reported that the message, which stated that Abu Sayyaf were planting eight suicide bombers in Kota Kinabalu and 10 in Kuala Lumpur was allegedly derived from information sent to police officers on the ground. The circular stated that Abu Sayyaf and IS have 8 suicide bombers in Sabah and 10 in Kuala Lumpur. Army deployed after reports that ISIL and Abu Sayyaf suicide bombers may be planning attacks in Kuala Lumpur. Kuala Lumpur, Malaysia – Malaysia deployed soldiers in its main city on Friday after unconfirmed reports of an “imminent terrorist threat” ahead of a gathering of world leaders for a regional summit, including US President Barack Obama. At least 2,000 army personnel were stationed at strategic points in Kuala Lumpur and another 2,500 were on standby. 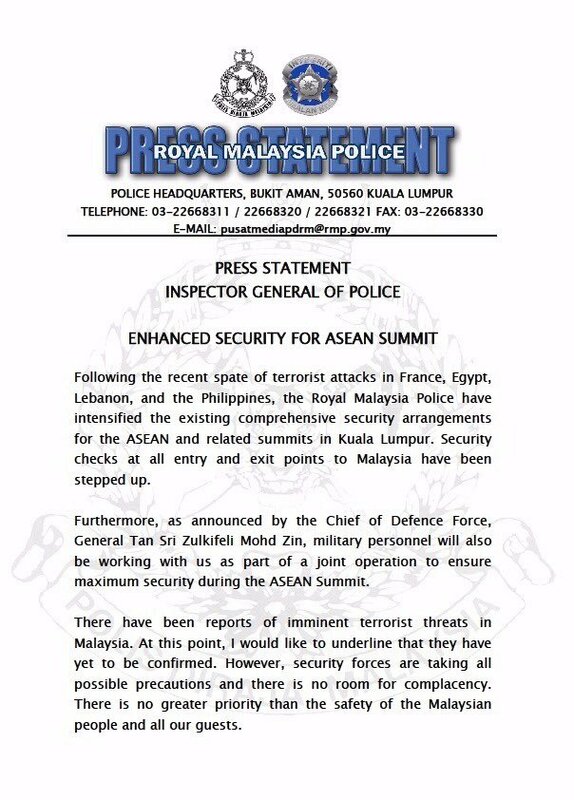 Malaysia tightened security following the attacks in France, Egypt, and Lebanon, Khalid said. The raised alert level comes after Bakar confirmed the existence of an internal police memo detailing the presence of at least 10 potential suicide bombers in Kuala Lumpur and eight elsewhere in the country. The police memo, leaked to local media, revealed details of a meeting last Sunday between members of the armed Philippine groups the Moro National Liberation Front and Abu Sayyaf, along with those from the Islamic State of Iraq and the Levant (ISIL). An agreement at the meeting was made to deploy Abu Sayyaf and ISIL fighters to Kuala Lumpur and to Sabah, Malaysia’s eastern-most state, the memo said. An internal police communique on the presence of suicide bombers in Sabah and Kuala Lumpur has gone into public circulation. Inspector-general of police Khalid Abu Bakar today confirmed the authenticity of the circular and expressed regret over the leak of the sensitive information. However, Khalid said, police are monitoring all potential threats and actions are being taken to thwart or neutralise them. He stressed that police would not compromise in dealing with terror elements. “We will not allow such things to happen,” Khalid told Malaysiakini. Dated Nov 16, the circular from the Sabah police headquarters is based on information obtained on a “meeting and planning” among Abu Sayyaf Group, Islamic State (IS) and the Moro National Liberation Front (MNLF). It states that meeting was held in Sulu in the Philippines on Nov 15 and was attended by 14 leaders from the three outfits and 50 members of Abu Sayyaf armed with M16 rifles, pistols and bombs. The circular revealed that several resolutions were made during the meeting, which included recruiting new members as well as dispatching Abu Sayyaf and IS elements to Sabah and Kuala Lumpur. It was also stated that Abu Sayyaf and IS have eight suicide bombers in Sabah and 10 in Kuala Lumpur. The circular called for police patrols and intelligence information to be increased as well as for all personnel to be vigilant and prepared. 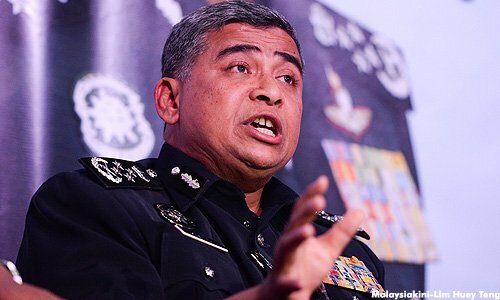 Inspector-General of Police Tan Sri Khalid Abu Bakar has confirmed the authenticity of a leaked internal police memo on the presence of suicide bombers in Sabah and Kuala Lumpur, Malaysiakini reported today. He told the news portal that police were monitoring all potential threats, and action was being taken to neutralise or thwart suicide bombers. “We will not allow such things to happen,” he was quoted as saying. Khalid also expressed regret that the sensitive information had been leaked to the public. 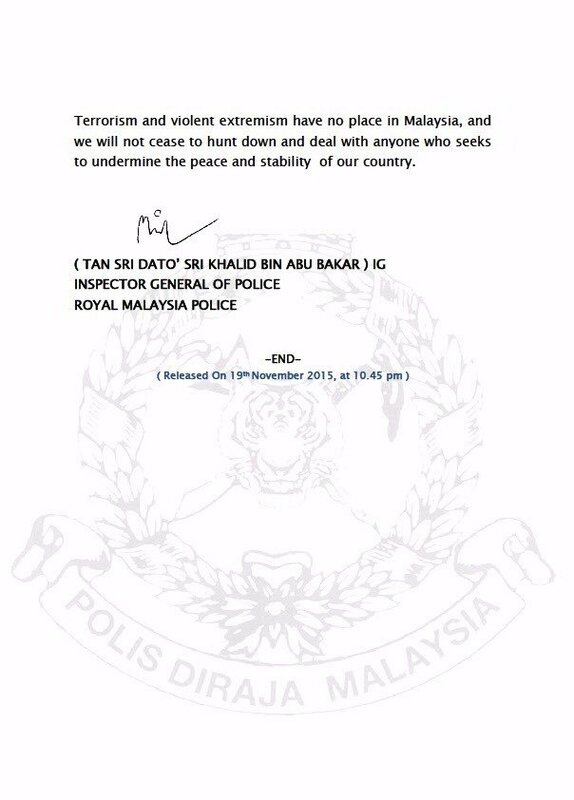 2 Responses to Police communique warns of suicide bombers in KL and Sabah! Police and Intelligence Personnel must be on high alert throughout the country.Those who exited the country to join terror groups must be watched upon on their return. They are a danger to the country though they are Malaysians.